NOTE: We are not lawyers. Seek legal advice from a professional Solicitor. The following is hopefully useful information. It is important to understand the legal issues surrounding airsoft*. The sale and purchase of our airsoft guns is controlled by some legislation called the Violent Crime Reduction Act 2006 or VCRA. Specifically “Sections 36 to 38: Realistic imitation firearms”. The intention of the Act was to stop realistic looking weapons getting into the hands of people who want to use them for illegitimate reasons. When the VCRA was introduced it made it an offence to supply a “Realistic Imitation Firearm.” A Realistic Imitation Firearm, or RIF, is a model of a real firearm which, to all intents and purposes, is indistinguishable from the real weapon. An Airsoft “Imitation Firearm,” or IF, is a model of a real firearm which, to all intents and purposes, is indistinguishable from the real weapon except it is not realistically coloured. IF bodies are painted more than 50% in a bright colour or have a transparent body. They are often called “Two-Tone” guns. You can legally still buy an IF as long as you are over 18. You are a ‘Regular Skirmisher’ with membership of an insured skirmish site. You are a member of a properly insured historical re-enactment group or society. You are a film, television or theatre production company. You are (or are acting on behalf of) a museum. You are a Crown Servant in pursuance of your Crown duties. These criteria are “valid defences” against the Violent Crime Reduction Act. If you want to buy a RIF you have to be able demonstrate that you have a valid defence against the VCRA and are a “Regular Skirmisher”. To qualify as a Regular Skirmisher you must play at least 3 games in a period of no less than 2 months. The easiest, but not the only, way to demonstrate you are a Regular Skirmisher is to register with the United Kingdom Airsoft Retailers Association (UKARA) Player Database once you have met the qualifying requirements. Tech Brigade is a properly insured and UKARA registered playing site so we can help register you. You can register online or go old school and register using a printed form. You will need to complete this form and pass it to Rob to get it signed off, rubber stamped and get your “TEC” player number allocated. This brings us to another issue. If you are under 18 and want to get your own airsoft rifle what are your options? You cannot buy an airsoft rifle if you are under 18. You may be gifted an airsoft rifle by an adult. So a parent could buy and give you an airsoft rifle. If an adult planning to gift an airsoft rifle does not have a valid defence themselves then they can only buy a two-tone rifle. If you are under 18 you cannot have a valid defence. As you cannot have a valid defence you cannot convert a two-tone Imitation Firearm in to a Replica Imitation Firearm by painting it another colour. *This explanation is simplified. 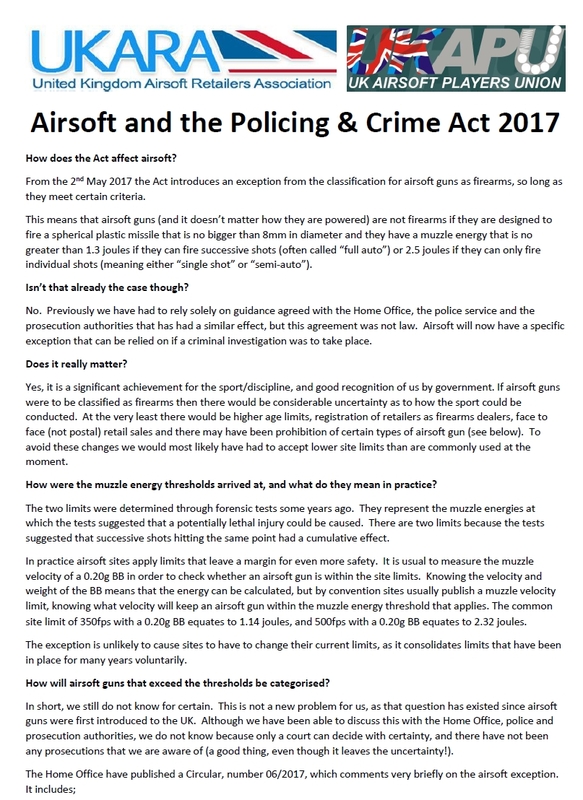 We highly recommend you do your own research on the legal aspects of Airsoft The UKARA website and the UK Airsoft Players Union (UKAPU) website are good places to start. There are more links to the legislation itself below. Circular 006/2017: firearms controls: This circular is about the new legal provisions on firearms in the Policing and Crime Act 2017.